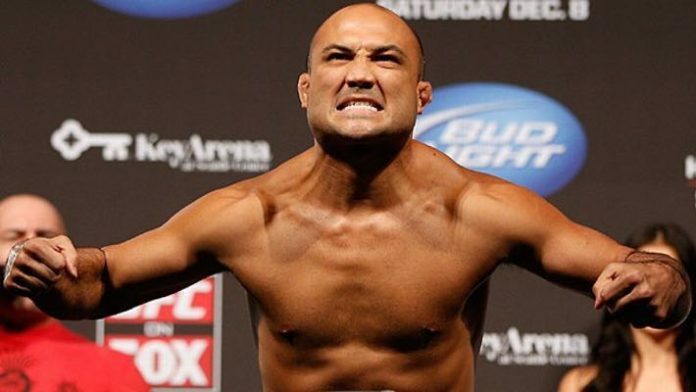 BJ Penn is once again fighting despite the fact that he hasn’t won a fight in nearly a decade. However, even though he may not have the support from fans like has had in years past of believing that he can win, he is staying positive. The MMA legend and UFC Hall of Famer is slated to fight Ryan Hall at the upcoming UFC 232 pay-per-view event. He addressed this fight in a statement posted on his official website. He has retired from the sport three previous times. Penn, who has been an icon to the MMA community, has won some big fights as a lightweight and welterweight in the UFC. He even captured both titles in the weight divisions during the 2000s. By looking at his fight record, he has gone 1-7-1 since April 2010. Just like every other fighter, there are ups and downs. Now, he is in the latter stages of his fighting career, which have been filled with disappointment. He recently decided to drop down to featherweight, and it lasted for three fights. He was TKO’d by Frankie Edgar and Yair Rodriguez before losing a majority decision to Dennis Siver in June of 2017. The UFC 232 pay-per-view event is set to take place on Saturday, December 29, 2018 at T-Mobile Arena in Las Vegas, Nevada. The main card will air on pay-per-view at 10 p.m. ET while the preliminary card will air on FOX Sports 1 at 8 p.m. ET and the promotion’s streaming service, UFC Fight Pass.